I had the chance this week to be in each of the school buildings watching as the 2013-2014 school year got underway. It was a great chance to see watch the students transition from summer to school year. I was also proud to see how well prepared the staff was for the students. I was in and out of classrooms in each building, and even though the year was just getting underway I saw engaged students with teachers already setting the tone for a great school year. I am making a renewed commitment to visiting classrooms and observing the teaching and learning that goes everyday in Saline Area Schools. I look forward to sharing more about what I see as the year goes along. 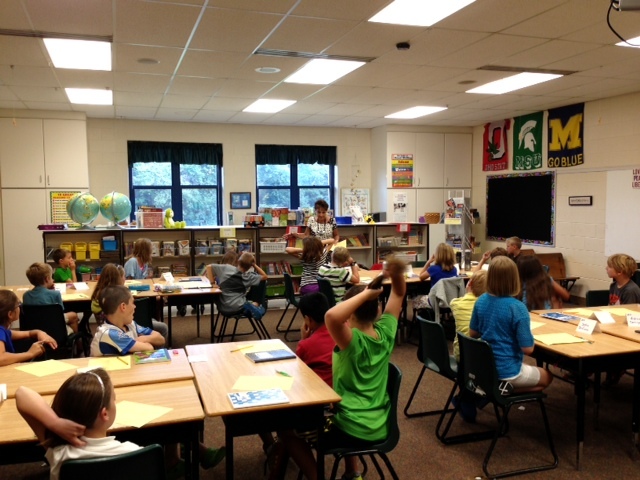 The picture above is from Mrs. Coughlin’s 5th grade classroom at Heritage. I stopped in to say hello and Mrs. Coughlin’s was moving around the room talking to her students about classroom rules, and where to find various items. I was impressed by her energy, as she had just gotten back from her son Patrick’s wedding. Patrick, a proud SHS alum, is in the Navy and was heading out to sea right after the wedding. Labor Day weekend can be a whirlwind in the life of a military/education family!